The East Sprague business area is getting a major facelift starting Monday. 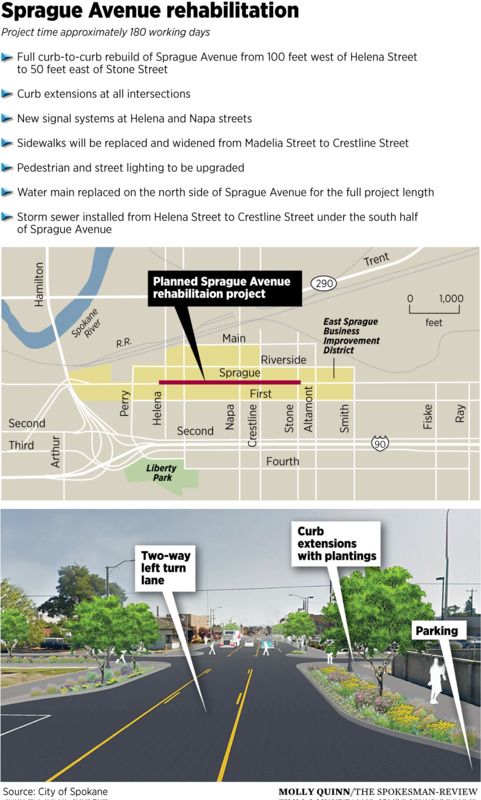 A $4.3 million project to rebuild Sprague Avenue is the latest in a long-sought effort to revitalize the business area into a lively mixed-use neighborhood. Sprague will be closed for the next six months. The first half of the project from west of Napa Street to Stone Street will close that segment for 90 days. The second half will follow with a 90-day closure from Napa west to Helena Street. L&L Cargile Inc., of Spokane Valley, is the contractor. Formerly a four-lane arterial, Sprague was restriped several years ago to two through lanes in each direction and a center turn lane. The project today will make that change permanent and build the necessary amenities to go with it. The end result should be a safer and more attractive street. “It is all about revitalization,” said LaVerne Biel, secretary of the East Sprague Business Association and a business operator of a technology firm along the strip. “This is kind of the physical manifestation. It is moving forward,” she said. “It’s been a long time coming,” Biel said. The project is getting strong support in the neighborhood, with roots dating back two decades or more when business owners banded together to call for help in remaking the area, she said. New sidewalks, landscaping, pedestrian lighting and refuge islands for pedestrians in the median are included in the project. They will go along with utility upgrades and full reconstruction and repaving of the street. The work is part of a trend to put four-lane arterial streets on so-called “road diets” by reducing them to two through lanes with a center turn lane. A similar project proposed for North Monroe Street from north of Indiana Avenue to the base of the Monroe Street hill has been met with controversy and opposition, although the project has its share of supporters who see it as a path to revitalization and a pedestrian-friendly environment. Over the years, Sprague has seen increasing investment in new and renovated buildings as well as new businesses locating there. Project supporters hope the remade street will encourage more of that. In a big plus for businesses, the project will create wider spaces for parallel parking, making it more convenient and safer for customers. City officials said they still have not decided whether to allow buses to load and unload without pulling out of the through lanes. Loading in the through lanes helps keep buses moving and allows for new bus stop amenities, said Marlene Feist, city spokeswoman. Only the stops at Napa and Helena streets would have the through-lane boarding, she said. East Sprague business and property owners supported the recent creation of a business improvement district. Under the district, owners contribute assessments for ongoing lighting, security, signage, furniture, planters, cleanup, maintenance and other needs. During this year’s closures, the primary detour will be on Second and Third avenues along Interstate 90. Local traffic will be able to circulate on First and Riverside avenues. Buses will go down First, Feist said. The annual Spokane Bike Swap and Expo will be Saturday from 9 a.m. to 5 p.m. at the Spokane County Fair and Expo Center. Bike consignment check-in will be on Friday from 3 to 8 p.m. at the Expo Center. More than 1,000 used bikes are expected in the Bike Corral sales. More than 60 exhibitors are expected. The cost for the event is $5, with children 12 and under free. Children 14 and younger will get a free helmet with a bike purchase. Also, sellers of small kids’ bikes costing less than $50 will not pay a sales registration fee. A bike commuter class is scheduled for 11 a.m. and a bike maintenance class is at 1 p.m. Bicycle fittings and instructions on loading a bike onto the front of a Spokane transit bus will also be offered. “The goal of the Spokane Bike Swap event is to enhance the biking community by providing an inclusive venue with affordable bicycles that can be used for recreation, health, fitness and transportation,” said a news release from the event. Proceeds go to the Friends of the Centennial Trail for trail projects. For more information and to preregister to consign a bike, go to spokanebikeswap.com. To drive the point home, the Washington Traffic Safety Commission is sponsoring an emphasis patrol to catch people texting or using a cellphone behind the wheel. Nearly 150 law enforcement agencies statewide and several in Eastern Washington will be participating. Violators must pay a $136 minimum fine. “Studies show that drivers are up to four times more likely to be in a crash when talking on the phone (hands free or hand held) and 23 times more likely to crash when entering information into their phones,” said a news release from the commission. In Spokane, Monroe Street will be reduced to one lane northbound between Summit Parkway and College Avenue starting Wednesday and continuing for one week. The lane closure is needed to allow room for work on a wastewater holding tank. Pettet Drive near T.J. Meenach Bridge will stay closed until April 10 due to construction of another wastewater holding tank. Landscaping work is starting this week along I-90 in the downtown area as part of the city’s “gateway” project. West Sprague Avenue at Adams Street is expected to reopen Monday, but traffic restrictions are going to be in place through the area during the multiyear wastewater tank project. On state Highway 21, the Keller Ferry will be out of service this week for repairs to the hull and steering drive chain. Service will resume at 6 a.m. on April 10 in time for the start of school. Elsewhere on state highways, closures were still in effect on U.S. Highway 395 northwest of Colville for water on the roadway and state Highway 31 north of Ione for mudslide danger.